Mr. Magic Lota Bowl is a totally self-working miracle, perfect for stage or parlor performances. 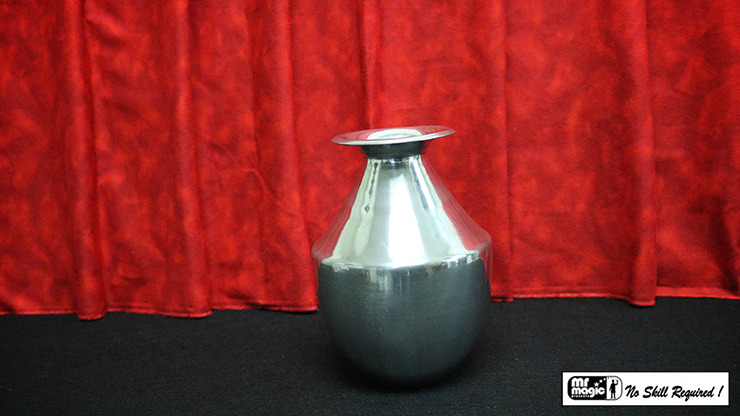 The Lota Bowl can be performed serious or as a repeating comedy prop in your act. The Lota Bowl is a classic prop. You make seemingly endless amounts of water appear in the bowl, which you continually pour out. Usually it's used as a gag throughout your show. Between tricks you keep emptying the bowl of water, yet it magically refills each time. This Lota Bowl is nicely made. It will make a great addition to your show. Your audience sees a beautiful bowl sitting on a table. The magician picks it up and pours water from it, into a bucket or glass. The audience can see that the bowl is completely empty. The empty bowl is placed back on the table. Moments later, the magician returns to the empty bowl and somehow pours out MORE water! This process can remarkably be repeated again and again throughout your show. Unbelievably, there seems to be an endless supply of water in this magical bowl! Made famous throughout the world by P.C. Sorcar, the Mr. Magic Lota Bowl is bound to amaze audiences. Includes the special bowl and written instructions.